The Riigikogu is the representative body of the nation; its members are elected by the people for four years. The Riigikogu has 101 members who make decisions which have the widest impact on the life of the nation. These include forming and supporting the national government making, amending and complementing legal acts and passing the state budget. Under the Constitution, which has been in effect since 1992, Estonia is an independent and sovereign democratic republic where the supreme power of state is vested in the people. Democratic states are governed by the principle of the separation of powers. This means that the legislative, executive and judicial powers balance each other. Under § 59 of the Constitution, the Riigikogu holds the legislative power, which means that the Riigikogu adopts legal acts. The government has executive power, e.g. the government is responsible for the implementation of legal acts. Justice is administered by the courts. Since Estonia is a parliamentary republic, the President has a predominantly representative function. The Riigikogu passes the state budget which determines the revenues and expenditures for the following year; this affects the development of all spheres of life. The Riigikogu also approves the report on the implementation of the state budget. How is the Riigikogu elected? All Estonian citizens over 18 years of age with an active legal capacity have the active right to vote. The passive right to vote, i.e. the right to be elected, is held by all Estonian citizens over 21 years of age with an active right to vote. The Riigikogu is elected for a term of four years. The election and the stability of the nation’s government depends on the Riigikogu. If no political party gains 51 seats in the Riigikogu, factions will unite in a coalition to form the government. The remaining factions of the Riigikogu will form the opposition. How large is the Riigikogu? The Riigikogu has 101 members which is approximately the cube root of the number of people in Estonia with the right to vote. The mandate of a Member of the Riigikogu commences on the day of the announcement of the election results. 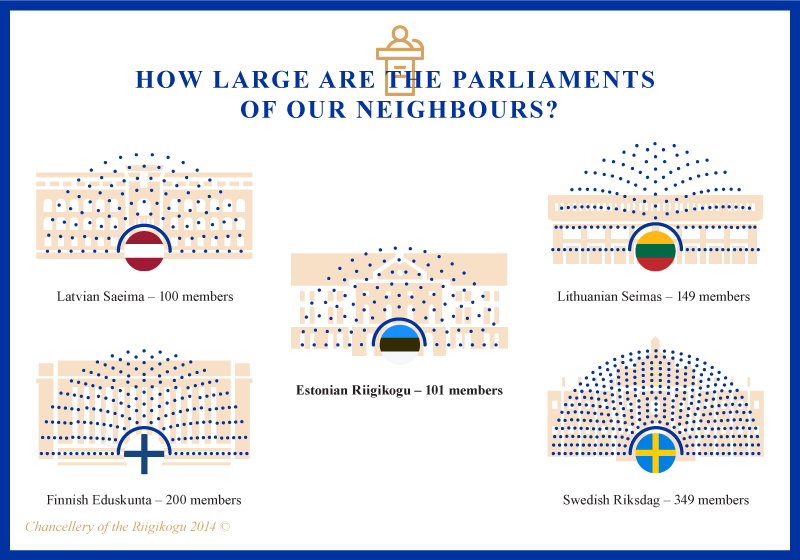 How large are the parliaments of our neighbours? … that already before the first Riigikogu, which was elected and convened in 1920, there had been representative bodies in Estonia with the right to initiate legal acts? The first of these, a representative body similar to a parliament, maapäev or the Provisional Assembly of Estonia, convened in 1917, and the second, the Constituent Assembly, was elected in 1919.